A St. Norbert education makes for a healthy world. Across campus, work in our labs and classrooms is contributing to better diagnoses, better care and better treatment options for all that ails us. We’re training better health professionals, as well, formed in the context of a mission that address the needs of the whole person. And we host a medical college on our campus, too! St. Norbert faculty members, often collaborating with students, are investigating a wide range of issues relating to health and wellness. Their findings have the potential for great benefit. Biologist Ryan King (at left, standing) has been studying regeneration for a decade, hoping to learn more about the possibility of regrowing human organs. King’s work focuses on planarians – flatworms living in streams and ponds. Planarians can be diced into hundreds of pieces, and each of those slivers will regrow into a new worm. King is specifically intrigued by the worm’s nephridium, a waste-removing organ similar to human kidneys: “We hope by studying these [nephridium] genes we will gain new insights into kidney biology and perhaps kidney regeneration,” he says. King is also studying the parasitic flatworms that infect approximately 200 million people worldwide, hoping to identify genes key to their existence that could then be targeted by drugs. Chemists Jon Russel and Cyndi Ochsner are carrying out pharmaceutical research on narcolepsy, a sleep disorder. Ochsner is studying the transport of dopamine, which regulates alertness, along with the pharmaceutical modafinil, currently used to treat narcolepsy. Russel and student researchers are creating synthetic molecules resembling dopamine and serotonin for use in her studies. And biologist Russ Feirer has been digging into the role of polyamines and their related enzymes for more than 20 years, zeroing in on cellular proliferation and metabolism. Information unearthed may potentially be useful in the development of cancer-fighting drugs. Psychologists Raquel Cowell and Michelle Schoenleber are focusing their attention on mental-health issues that often strike college-age students: risk-taking and addiction vulnerability, and self-injury. A few years ago, Cowell and student Briana Scott ’19 began digging into whether those who take more risks are also more likely to use drugs and alcohol. They also wanted to determine whether people who grew up in a stressful environment, such as a home with a lot of fighting, were more likely to be risk-takers. Current thinking says students who were exposed to stress are more likely to make poor choices than those who weren’t. And students in their first and second years of college are more vulnerable to risk-taking, as their brains are still maturing. Cowell’s research may ultimately help mental-health providers offer more targeted services to those who need to improve their self-control and coping skills. Schoenleber first delved into self-injury research in graduate school, where she looked at whether this behavior was motivated by shame. Prominent theories say people self-injure to rid themselves of unpleasant emotions, or because they believe they’re bad and deserve punishment. But Schoenleber’s work shows self-injury is also linked to actual shame. In fact, she found people with no history of self-injury reported fewer feelings of shame after experiencing physical pain. “This might help explain how initial experiments with self-injury lead to a pattern,” she says. More importantly, her work indicates that intervention methods for those injuring themselves should focus more on alleviating shame rather than targeting specific associated disorders, such as PTSD or drug abuse. Jamie Lynch is a medical sociologist whose most recent research examines the causes and consequences of the education-health gradient in self-rated health and obesity. And, one floor below his office in Boyle Hall, Anna Herrman ’07, on the communication faculty, studies eating disorders and body image from a communication perspective. It can be tricky. If a child loses a few pounds and family members say she looks great, that can create the notion that she should shed even more. The child may also feel her self-worth is determined by her exterior image. Parents can help by talking about how people come in different shapes and sizes, Herrman says, and by explaining that media images are unrealistic and often false. St. Norbert alums are helping to make the world a happier, healthier place. Take Brian Hoffmann ’05, now in the joint department of biomedical engineering at the Medical College of Wisconsin and Marquette University. Hoffmann’s independent lab uncovered evidence that sugar and artificial sweeteners negatively alter our metabolism and energy, potentially leading to metabolic syndrome, obesity, cardiovascular disease and diabetes. Or, take Ryan Fiorini ’00 at blinktbi. The business, which he co-founded, purchased the technology to detect concussions within 20 seconds via puffs of air to the eye, then enclosed it within a 4.5-pound, handheld device expected to be FDA-approved this fall. “Go into whatever you decide to do with an open mind and be willing to diversify your interests,” Hoffmann says. Veterans are benefiting from the work of Jessica (Thull) Brundage ’03, a psychologist at Milwaukee’s Clement J. Zablocki VA Medical Center. Brundage works with vets coping with spinal cord injuries and disorders, plus their families. Her work includes those newly diagnosed and participating in rehabilitation as well as vets coming in for yearly checkups or acute medical care. A trio of alums works at the BloodCenter of Wisconsin: Bonnie Atkinson ’89, Daniel Bougie ’87 and Julie Peterson-Bougie ’86. Atkinson, a 27-year employee, initially worked in the lab performing testing for organ and bone marrow transplants. Over time she segued into blood manufacturing; today, she’s a senior quality analyst working with information services to build and validate its computer systems. Daniel Bougie, a senior research scientist, spends some of his time investigating why immune systems may go haywire after a person receives a blood transfusion. “Knowledge inspires me,” he says. “I have learned a lot, now that I realize I know next to nothing!” Daniel’s wife Julie, also a research scientist, examines the function of tissue factor pathway inhibitor (TFPI), one of several proteins in blood vessels that prevent the formation of blood clots. A better understanding of how TFPI works may shed insight into serious bleeding and blood-clot disorders such as hemophilia, heart attack and stroke. Out in the wider world, Jill Yashinsky-Wortman ’05 is director of Gonzaga University’s Center for Cura Personalis, (Latin for “care for the whole person.”) The center focuses on educating its students about alcohol and other drugs, mental and emotional well-being, and healthy relationships. It also offers treatment and support. “Inspiration can be found anywhere,” she says. Although Katie Wickman ’03 once worked as a clinical nurse and infection preventionist, she is now a sustainability manager with Advocate Health Care, where she works to lessen the organization’s environmental impact. In 2016, she traveled to Ghana with Project C.U.R.E., a partner organization that uses excess supplies and decommissioned equipment donated by Advocate to help global citizens. Ted Dugas ’72 is a licensed acupuncturist serving New York’s Broadway community – an interesting fit given his specialization in treating soft-tissue injuries through both Japanese and trigger-point methods. “It’s thrilling and exhilarating to work on these talented athletes, actors, dancers, comediennes and stagehands,” he says. 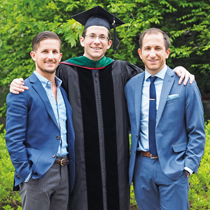 In what may be an SNC first, three brother alums all subsequently earned M.D.s from the University of Wisconsin School of Medicine: left to right, Matthew Szadkowski ’06, Michael ’09 and Adam ’05. Adam is currently completing a fellowship in pediatric cardiac critical care in Melbourne, Australia, then plans to return to work in an academic pediatric intensive-care unit. Matthew is on the faculty at Primary Children’s Hospital in Salt Lake City and spends his nonclinical time training others on the use of ultrasound in the emergency department. Michael works at Journey Mental Health Center in Madison, Wis.
A strange thing happened one day in Washington State University’s chemistry lab: an occurrence that netted Jacob Day ’13 more than $100,000 in the form of a prestigious National Institutes of Health (NIH) research fellowship. In 2017, the chemistry Ph.D. student was attempting to create benzothiazole sulfonate (BTS), an organic compound. But his experiment took a surprising twist when, after creating the BTS, he found it released sulfur dioxide in a predictable manner. After his discovery, Day applied for the highly selective NIH fellowship awarded to the nation’s top graduate students in health-related fields. Day was selected as the first person to have verifiably made and isolated BTS, and for his subsequent efforts at its development. The newest addition to St. Norbert’s summer-camp schedule is a Summer Academy of Medicine, undertaken in partnership with MCW-Green Bay. High-schoolers exploring careers in medicine and the biomedical sciences will get hands-on experiences in the educational fields they may require to follow their vocation. Before entering religious life, the Norbertine bishop of Sarepta (1297-c.1378) had worked as a physician in northern Italy and probably in Spain. Even after his episcopal consecration, Thomas of Wroclaw contained to be well known both as a priest and physician. 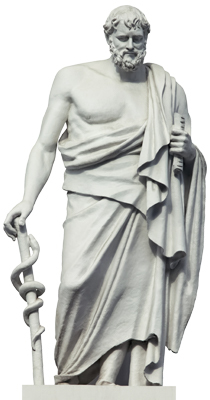 He was the author of several treatises on medical subjects that included hygiene, medical practice, phlebotomy, blood and urine. His most important work included a directory of medicines. The Rev. Ted Antry ’62 – a renowned scholar of things Norbertine – produced a critical edition of Wroclaw’s Practica medicalinis while still in grad school at the University of Notre Dame. A $30,000 grant from the NCAA is supporting efforts at St. Norbert to continue shifting the campus culture toward responsible attitudes and behaviors regarding alcohol consumption. The grant, which will also help fund fun, safe, alcohol-free recreational alternatives on campus, is specifically targeted to athletes and first-year students. Some 15 million Americans have food allergies! The Caf debuted its allergen-friendly station this year to provide a necessary space where those with restricted diets can customize and receive their food while avoiding contamination. 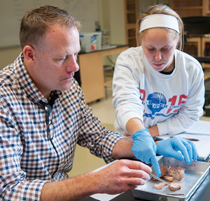 St. Norbert is one of the few private liberal arts colleges in the United States that has an anatomy lab with cadavers available to undergraduates. 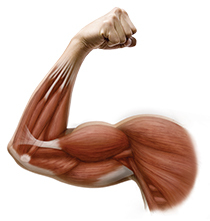 Local surgeons can also make use of the lab for training purposes. When Colton Wiesner ’16 led his TRIPS team on a return visit to Nicaragua, his luggage included 40 new stethoscopes and 40 blood-pressure cuffs to donate to the under-supplied clinics where they students served. The team raised more than $5,000 to purchase the medical supplies. St. Norbert College faculty are among those who teach MCW students on campus. Deb Anderson (Biology) teaches anatomy; Russ Feirer (Biology) and Cyndi Ochsner (Chemistry) teach sessions in the Molecules to Cells course; David Hunnicutt (Biology) teaches sessions in Infectious Agents & Host Immunity; David Bailey (Biology) teaches medical neuroscience, reproduction and endocrinology. Feirer and Bailey also teach MCW students in Milwaukee. Ancient herbals dating back to the 16th century that belonged to the Rev. Anselm Keefe, Class of 1916, can still be consulted in the college archives, along with other volumes from the significant collection of the renowned St. Norbert biologist. The college's health sciences majors offer students the chance to work closely with advisors to ensure their undergraduate studies prepare them for admission to the post-graduate school of their choice. Most students aiming to enter the health sciences pursue majors in biology, chemistry, natural sciences or psychology. 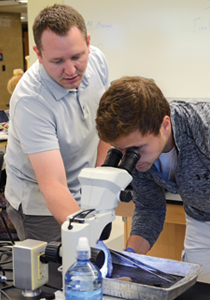 A St. Norbert education also offers opportunities for students to collaborate with faculty on research projects as early as their first year, giving them an edge in the competition for post-graduate school admission. Students showcase their research projects each spring during the Undergraduate Research Forum, and some have gone on to present at academic conferences and to co-author scientific papers. Pre-Medical: One of the largest areas of focus for incoming students. The pre-med track also prepares students for post-graduate work in the fields of physical therapy, chiropractic, occupational therapy and physician assistance. Pre-Dental: Depending on the prospective dental school, students complete a minimum of three years of science-focused courses. Pre-Veterinary: Pre-veterinary students' hands-on experience with animals includes the chance to care for the campus dog Abbey! Pre-Pharmacy: A new partnership between St. Norbert College and the Medical College of Wisconsin allows students to reduce their time to a pharmacy degree by a full year. Nursing: St. Norbert's partnership with Bellin College allows students to earn a nursing degree with a liberal arts foundation. Students start on the SNC campus, then transition into a 15- or 24-month program at Bellin College. 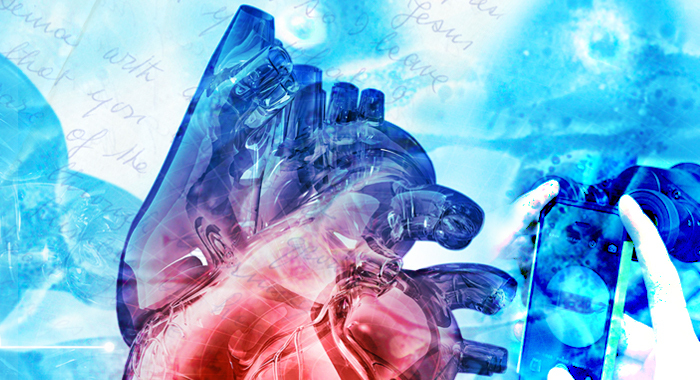 At medical agency HDMZ, work by Lindsey Pionek Mattucci ’08 may illustrate basic anatomy or complex ideas, such as how genome editing can be used to design therapeutics. It was a Norbertine who encouraged the founder of the Missionaries of Charity to offer the order’s healing ministry to the poor in Lima, Peru. Mother Teresa of Calcutta encountered the Rev. Richard Mulroy ’37 and other members of the Norbertine community ministering in Peru. Correspondence between the Norbertine priest and the saint is still treasured in the archives of St. Norbert Abbey. 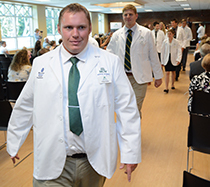 The Medical College of Wisconsin (MCW) makes its home at St. Norbert College in a partnership – perhaps unique for a liberal arts campus of this size – that provides opportunities for both communities. The expansion of MCW into the Green Bay area took place in response to projections of a significant physician shortage in Wisconsin.